One of the most helpful places on the internet when it comes to all things horror and Halloween, Goblinhaus keeps track of Halloween News, details an international Horror Convention Calendar, a Store ranging from new to the Vintage and recently, the first release on Goblinhaus Records: Transylvania-Mania by Monster A-Go-Go. The Pre-Order is on sale now. Buy now! 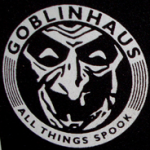 We talked with the grand poobah of Goblinhaus, Shrub Roundtree. What has been the best Halloween decoration you’ve seen–EVER? Aw man, well being a lifelong Halloween fanatic, I’ve seen a lot. I trick or treated up until it was borderline unacceptable and could only make myself stop by putting on no budget haunted houses in my garage instead. Then as I got old enough to drive I started hitting as many of the professional haunts as the calendar would allow and now have attended the haunt shows like Hauntcon and Transworld where they roll out the latest and greatest in Halloween props and décor. Of course the annual tradition also includes hitting every store in town that has anything at all Halloween related on their shelves to see what’s new. But when it comes down to it, for me, Halloween is all about the mood. Just the simple, creepy aesthetic is what I love the most about the season. It’s not about the biggest, most terrifying or elaborately animated thing. If I walk into a haunt or see a decorated yard that just has that great vintage, spooky Halloween feel to it, that’s what I love the most. It’s all about the VIBE. That said, when I read the question, the decoration that popped into my mind first was when I was very young and my mother turned a lamp post in our front yard into a ghost. A sheet with eye holes and a magic marker face that was made to glow, the simplest thing ever. And an absolute thrill.